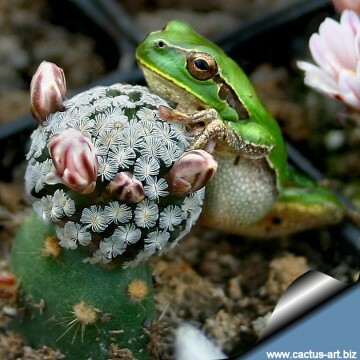 Origin and Habitat: It is a Critically Endangered cactus endemic to a single small area of occupancy less than one square kilometre (Rancho El Vergel - Municipio de Galeana) in Nuevo Leon Mexico. The entire range of the species is on a private land behind an electric fence, but access is available for a small fee. As the location is well-known to both commercial and amateur collectors, the species is experiencing continuing declines as a result of illegal collecting. The population is estimated to be less than 500 individuals. But it is supposed that there is more than one population and it could be quite variable. Altitude: 1900-2000 metres above sea level. Mammillaria sanchez-mejoradae f. prolifera hort. 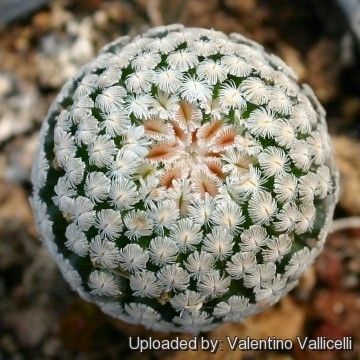 Mammillaria sanchez-mejoradae f. rubra hort. 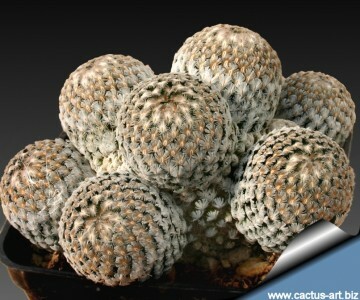 Description: Mammillaria sanchez-mejoradae is a very slow growing miniature cactus with tiny feathery combed spines. Stem: Flattened-globose or globose, bright green to 3 cm high, 1-3 cm in diameter. Tubercles: Conical, without latex, axils naked. Radial soines: 30 to 40 hairlike (or plumose) pectinate, rigid, white, flattened against the tubercles, 1,5-2 mm long (rarely up to 3 mm) long. 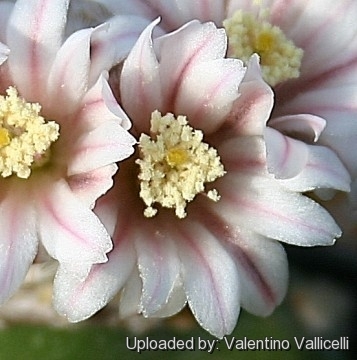 Flowers: Campanulate,up to 16 mm long and 20 mm in across variable from white to pink-rose. Fruits: Club shaped to globose, completely embedded in the plant (cryptocarpic), red, 3-8 mm in diameter. 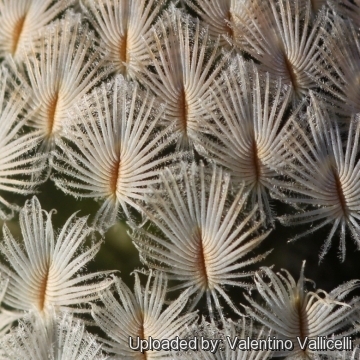 Mammillaria sanchez-mejoradae Rodr.González: has globose stems to 3 cm high, 1-3 cm in diameter. 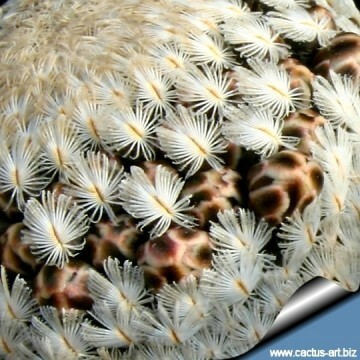 Radial spines 30-40 hairlike pectinate, white 1,5-2 mm long. Distribution: Rancho El Vergel, Municipio de Galeana, Nuevo Leon. 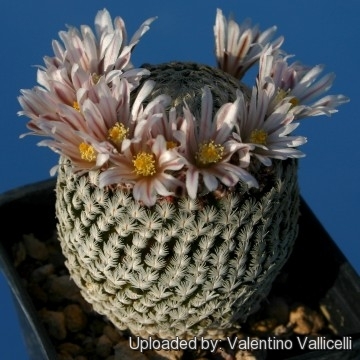 Mammillaria sanchez-mejoradae f. prolifera hort. : is a free clustering clone with smallish bodies (less than 1,5 cm in diameter). 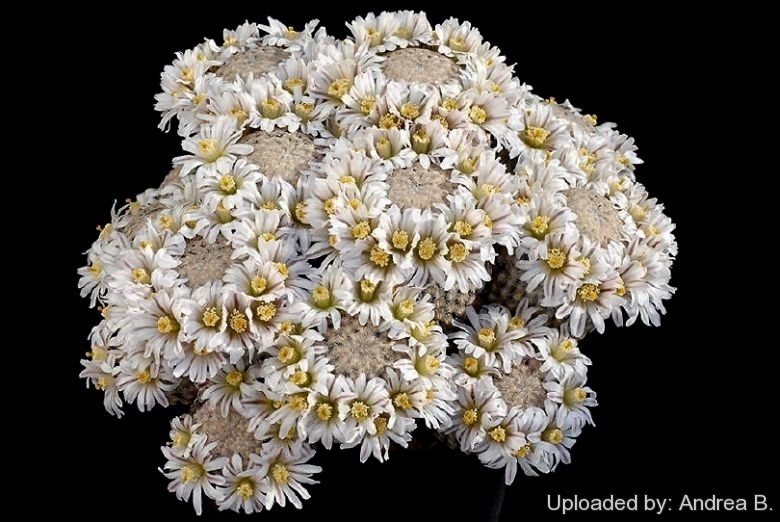 Mammillaria sanchez-mejoradae f. rubra hort. : has a bright orange-red colour due to the absence (or reduced production) of chlorophyll pigments. 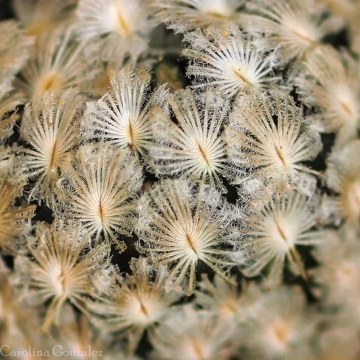 Cultivation and Propagation: Mammillaria sanchez-mejoradae has not the fame to be easy to cultivate, but in good conditions with very careful application of water and excellent ventilation, it grows without difficulty. Be careful to encourage slow growth, but if you succeed in growing a colony of stems, then the results will repay all the growing efforts. Repotting: Repot every 2-3 years. A small pot with fast draining soil will be required, and the plant should be planted high, with gravel top dressing partially supporting it above the potting mix.